I am back in the saddle this morning after a week away. Markets moved like they normally do when I am off the screen, I hope you took my advice and bought volatility. July options expired Friday at the CBOT and the market action did not disappoint. Corn fell 25 cents or 5 strikes last week, putting the 360’s in the money which were trading almost for free last Monday. Soybeans traded into new lows, July futures did hold off the 9 strike which would have put many more shorts in the market this morning. Wheat was quiet last week but has taken the downside volatility mantle with KC wheat falling almost 9 cents in the overnight. CBOT FND is on Thursday afternoon, so if are holding on to July basis or delivery contracts you will be put to a decision by then. Cotton continues its free fall on the back of fund short covering. Fund net length sat at 50 K net long on Tuesday, almost half of where it was a month ago. I suspect this is just the beginning of the volatility as we have a monster couple of weeks ahead, this week especially. Grain stocks and acreage updates come on Friday, which happens to be the end of the quarter and first notice day. Hog traders have a massive report on Thursday to pay attention to, and oh yeah…the weather bares watching. If you have been working with me for a while you know I am fond of looking for trend changes around USDA reports and the end of the quarters, we have both this week. Given the massive shift in sentiment over the last few days, I would not be shocked to see a big time turn around after the break for the 4th of July. CORN: The open interest from a week ago Tuesday showed a massive shift in sentiment among fund traders. Those new longs were crushed late last week as forecasts for the next week showed little to worry about over the short run. The Sunday night forecasts showed little as well stateside. We are about two weeks from pollination starting across the belt, the forecasts will dictate the price action when things are quiet. Overseas forecasts are supportive. I think the break last week had to do with new longs selling as well as farmer selling into July delivery. Corn bulls do have a trade-able story coming into Friday’s report though. Acreage will be scrutinized with the late planting pace, if the acreage comes in under the March report number (90 million), grain stocks is not bearish and forecasts would show hot/dry…watch out. SOYBEANS: The story of beans, or the lack thereof is what is pressuring price. Carry spreads have widened out to contract lows (nov/nov) as the cost to store beans goes up. I would not chase the price here though as we are approaching crop insurance levels for many and the open interest in near record to the short side. Grain stocks for beans looks to be somewhat supportive and should offset an increase in acreage. Conditions for soybeans appear to be solid, yields should start somewhere close to trend for the USDA. I expect some short covering this week or next, July delivery should attract some supply but after that I expect the doors to shut for a while. WHEAT: The story in wheat is multi-layered. European forecasts are hot and dry over the short run, we expect a smaller crop there. Then you have the Minny wheat story, which has been supportive of the entire complex, sits almost 1.70 over the KC offer. Open intrerest in Chicago wheat is almost neutral at this point with total outright longs near where they were at the highs in 2012. I think you gotta look at protecting wheat over the next few weeks given harvest pressure and July delivery approaching. I would be a seller of Chicago over Kansas City, but either is probably a decent play. You have to wonder how much more negativity can be priced into Minny to support. I will say this for beans and corn, wheat and oats stayed firm last week which should give bulls some support. That said, I would avoid re-owning wheat until after July delivery, I expect we will see a lot of grain sold off harvesters and from storage over the next few weeks. 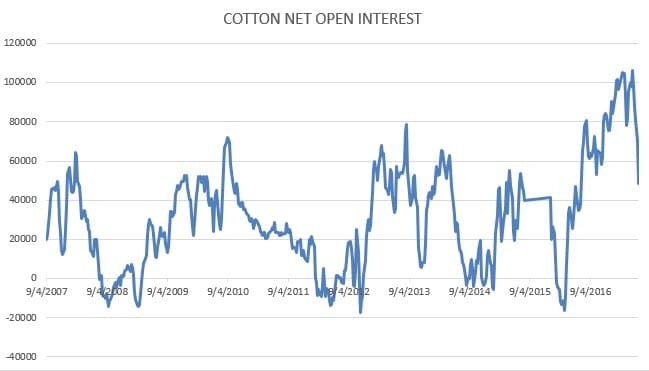 COTTON: Markets had something going this morning with a push back toward 68, but that fell apart.Friday saw a reversal on the charts, but I think that is short lived. Friday’s report should show more acreage, and the WASDE two weeks later should show good prospective yields. West Texas is looking at .5 to 1.25 inches of rain as well. Long liquidation is the theme right now with more ahead. I look for a test of 65 cents some point soon, maybe by this week. Given higher US acrage and yields, combined with the lack of a global growth story has this long position looking to fall. July delivery could provide some upside like it did in May, but bulls need either exports to pick back up or weather to affect conditions. Without that I look for lower prices by harvest. I do like rolling protection down with the hope of re-selling a push back toward 70 if those factors occur.